A Consequential President is an indeed generous overview of the Obama administration about Obama's message of change in 2008. Pulitzer Prize winning author MICHAEL D'ANTONIO delivered of Obama as an individualist who prior to 2008 was certainly an unlikely presidential candidate but his change campaign led to his nomination as the 44th President of the United States. D'Antonio hails from the vibrant journalist team at Newsday who happen to also write "The truth About Trump" where he put together years and decades of interviews and coverage of incoming newly elected President Donald J. Trump. Obama's change message gave a sign of "hope" which is similar to the new message of "Making America Great Again" by incoming President Trump. Obama's first signature as President was the Economic Recovery Act in 2008 to save the Auto Industry. The events that followed gave economic stability on the stock market and unemployment's reduction at 5%. Yet came with this were challenges on opposition from the US Congress and controversies such as the question of American citizenship. As Obama winds down his last few days amidst a visit to Capitol Hill yesterday in trying to save his latest signature of the "Affordable Care Act", exchanges between the two major parties as to repealing it or saving this act. It is a true fact that today about 20 million Americans uses the Affordable Care Act which earlier on pave the way to ending the inadequate access of medical treatment by not having medical insurance. This book also touches on Obama's energy policies in cutting cost of generated power from the sun, wind and even fossil fuels. It continues on Obama's efforts on climate change on global warming and nuclear weapons in Iran. 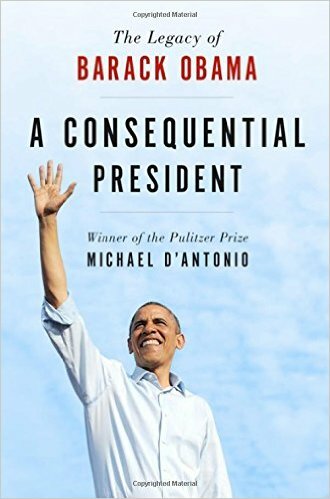 D'Antonio not only writes on the major accomplishments of this presidency but also those not heard or much publicized contributing to the legacy of Barack Obama as President. D'Antonio noted Obama the first African American minority president as an inspirational leader who had to function and navigate race relations of being black while delivering the promise of hope and change. As any outgoing presidents in the past, books, memoirs are written as they leave the office on their life, tribulations and legacy. The past developments on the last few days in office, staying in Washington for a while and the recent Capitol Hill visit yesterday somehow gave speculations of what and how Citizen Obama will be in the coming days and years after his presidency. For now a salute to Michael D'Antonio for writing this great book and till we meet again the 44th President Barack Obama.